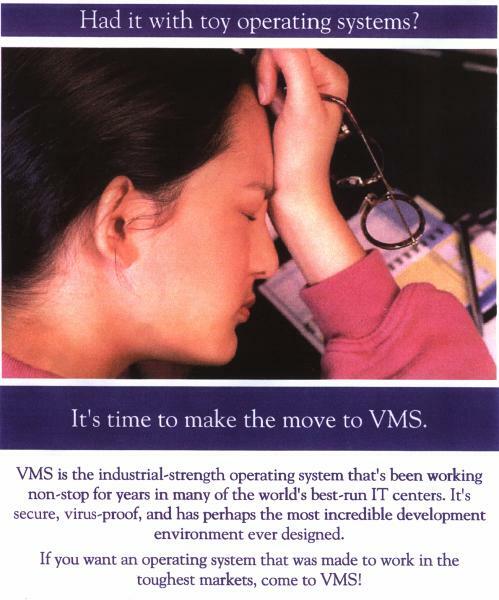 This page is dedicated to OpenVMS - widely considered one of, if not THE BEST Operating System ever developed. Some call it "legacy". They don't realize that "legacy" means "stuff that just works". Without compromizes. I worked with it for over 15 years, and have experienced it to be stable, reliable, and secure. Cool and unhackable (not my words. This has been the "verdict" that US hackers gave on the DefCon-9 conference in Las Vegas, 2001). You want disaster tolerance? This (YouTube) video proves what you should use, if FAST failover matters. Just count the seconds. I look it this way: If you require high availabity, or superious security, it should be built-in into the Operating System, not added upon it as a layered product. That's where OpenVMS is top-of-the-bill (and NonStop, to be honest, but that requires an even bigger purse). Some more links can be found here. It's a matter of knowing how to do things. Mostly, it's all in manuals, but digging through a 1000 page manual to find out that what you wanted gets another name and is found somewhere in the beginning, can be frustrating. Why find out again if someone else has done the trouble for you? Finding out yourself is good for undertanding, but often, frustration is the showstopper. If you are a non-professional - or not-so-professional - VMS user, there are resources available, but as far as I know, not yet in Dutch. Well, that has been solved with these OpenVMS Forums. But I decided to close that because of the fact it is polluted by abusers trying to post their adware on the site. Until I have found a proper solution to prevent this, it will be kept down. The Webring for OpenVMS enthusiasts. Visit Ring-Master.Net for more rings to join.